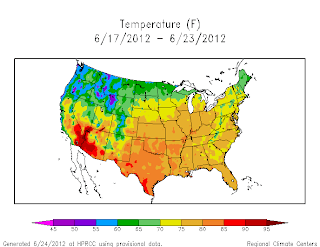 Image (click to enlarge): The U.S. surface temperature map from Unisys at 4 pm, June 29,2012, shows 100° temperatures stretching almost continuously from California eastward to the Carolinas. 5:30 PM Update: Washington Dulles breaks the all-time June temperature record by another degree, with a preliminary high of 102°. Washington National comes in with a June record of 104°, as noted below. 10TH IN 2007, AND SEPTEMBER 6TH IN 1954. OF JUNE WHICH LAST OCCURRED ON THE 20TH OF JUNE IN 1887. 5 PM Update: The period of record at Washington Dulles is relatively short (50 years), but the current 101° breaks the all-time June high temperature record of 100° on June 27, 1964. The 105° in the current hour at St. Louis would have been enough to tie the all-time June high, but it was already 108° yesterday. "Nashville International has now reached 109 degrees breaking the old all time high set eight minutes ago." RECORD OF 102 DEGREES THAT WAS PREVIOUSLY SET IN 1874 AND 2011. TIES THE PREVIOUS ALL TIME RECORD FOR JUNE OF 103 SET YESTERDAY. DATE...WHICH WAS 102 DEGREES LAST SET BACK IN 1952. FIVE OTHER DATES---THE MOST RECENT OF WHICH WAS AUGUST 10TH IN 2007. The 107° at 4 pm at Nashville is enough to break the all-time June record of 106° on June 30, 1952 and ties the all-time record high on July 27 and 28, 1952. This is only the 6th time the temperature has exceeded 105° in records dating back to 1873. Temperatures soared early this afternoon into triple digits across a wide area of the Mid Atlantic and Southeast. By 2 pm, readings were near or at all-time June heat records at several locations. After soaring an amazing 11° to 96° in the hour from 9 to 10 am, Washington, DC hit 102° at 2 pm, tying the all-time June record most recently tied . . . just last year. By the following hour, the temperature reached 103°, a new monthly record. The official Baltimore observation at BWI Airport was 101°, but at the Maryland Science Center downtown, the 105° at 2 pm would have been enough to tie the all-time June record set on this date in 1934. At Columbia, South Carolina the 108°F (42.2°C) at 3 pm is unofficially a new all-time June record, exceeding the 107°F on the 27th in 1954. The 104° at Raleigh at 3 pm unofficially ties the all-time June record, also set on the 27th in 1954, based on National Climatic Data Center records from 1887 through 1944 at downtown Raleigh and since 1944 at RDU Airport. At Charlotte, North Carolina the 3 pm reading of 103° unofficially ties the all-time June record, set . . . also on the 27th in 1954. 7 PM CDT Update: The updated high temperatures and new all-time June records are 108° at St. Louis and 107° at Columbia, Missouri. 4 PM CDT Update: The 106° so far at Evansville, Indiana is unofficially an all-time June record, surpassing the previous maximum on June 26, 1954 by 2°. TEMPERATURE ALSO WAS TIED FOR THIS DATE. DEGREES...MAKING IT THE HOTTEST JUNE DAY EVER RECORDED IN THE CITY. AND JUNE 25 2012 /3 DAYS AGO/. THE PREVIOUS RECORD WAS 105 DEGREES ON JUNE 20 1936. 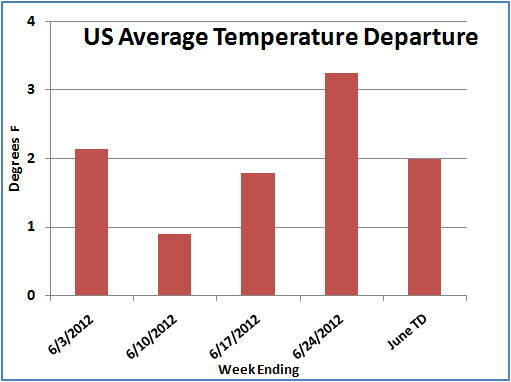 RECORD FOR THE MONTH OF JUNE WAS 102...LAST SET JUNE 25 1988. WAS LAST 104 DEGREES ON JULY 14 1954. WEATHER RECORDS BEGAN IN INDIANAPOLIS IN 1871. REGIONAL AIRPORT TODAY. THIS BREAKS THE OLD RECORD OF 103 SET IN 1936. ST. LOUIS TODAY. THIS BREAKS THE OLD RECORD OF 104 SET IN 1952. ON JUNE 25 1952 AND JUNE 19 1936. THE RECORD HIGH TEMPERATURE FOR THE MONTH OF JUNE. 4:30 PM CDT Update: After tying the all-time record high temperature with 110° yesterday, Dodge City has reached 111°, which breaks the record. 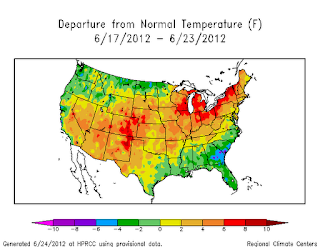 The National Weather Service reports, "The record was set in 1998 on June 29th and was tied in 2011 on June 26th. Records for Dodge City date back to September 15th 1874." 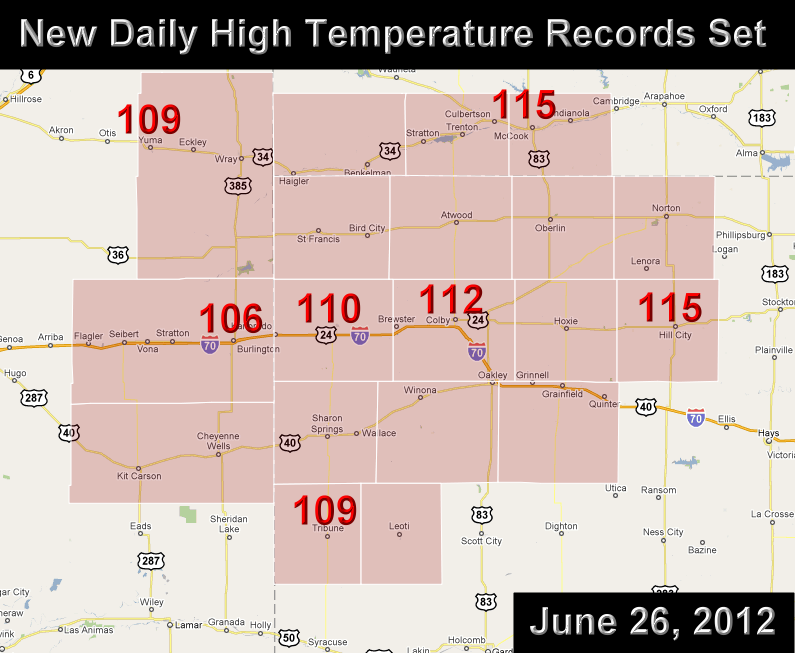 The report of 115°F (46.1°C) in the current hour at Hill City, Kansas ties yesterday's all-time June record high temperature. This is the 5th consecutive day of 110°+ temperatures at Hill City. The precipitation so far this month of 0.42" is only 17% of the June average in this drought-stricken region of the High Plains. Hot and dry conditions are expected to continue through the remainder of the summer. 7 PM MDT Update: A preliminary report from the National Weather Service confirms the Goodland record high of 110° at 2:53 pm, eclipsing the old daily record of 107° in 1971. The 115° high temperature is a new all-time June record at Hill City, where records began in 1896; it smashes the old daily record of 110° in 1980. Also in Kansas, Dodge City (110°) and Garden City (108°) tied records set just last year. 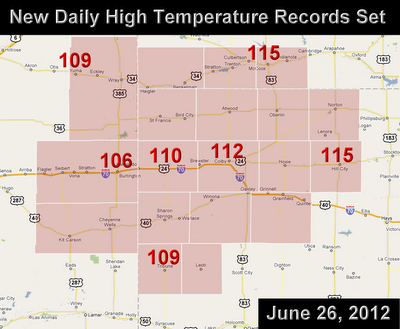 Russell, Kansas hit 112°, breaking the record of 108° in 1980. Burlington, Colorado also crushed a record with 106°, exceeding the 102° in 1990. The prize for excessive record margin goes to McCook, Nebraska, where the 115° high was 12° above the old record of 103° in 1998. McCook climate records began in 1896. Yesterday's high of 107° also set a daily high, breaking another 1936 record of 104° which was tied in 1990. Goodland climate records date back to 1895. 100 DEGREES SET IN 1991. A RECORD HIGH TEMPERATURE OF 105 DEGREES WAS SET AT LITTLE ROCK ADAMS FIELD TODAY. THIS BREAKS THE OLD RECORD OF 101 SET IN 1998. According to National Climatic Data Center reports from the city location at the State Capitol until 1942 and since then at the airport, this ties the all-time June temperature record for Little Rock on the 20th in 1936 and the 29th in 1988. MONTH OF JUNE...SET ON JUNE 18, 1936. MONTH OF JUNE...SET ON JUNE 30, 1933. SET ON JUNE 15, 1946. TODAY. THIS BREAKS THE OLD RECORD OF 104 DEGREES SET IN 1990. TODAY. THIS BREAKS THE OLD RECORD OF 108 DEGREES SET IN 1911. 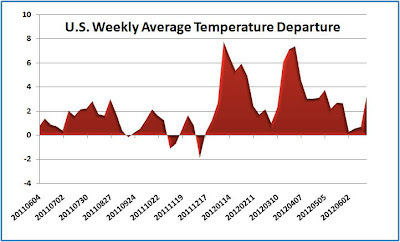 Preliminary data from 214 National Weather Service stations indicate that the 48-state contiguous U.S. average temperature was above normal for the 28th consecutive week in the 7 days ending yesterday (June 23). Once again, the Pacific Northwest and Southeast were relatively cool, but the heat intensified in a broad range from the Southwest through the middle of the country to the Mid Atlantic and Northeast. The weekly unadjusted average was 3.2°F above the 1981-2010 climatology, up from 1.8°F the previous week. 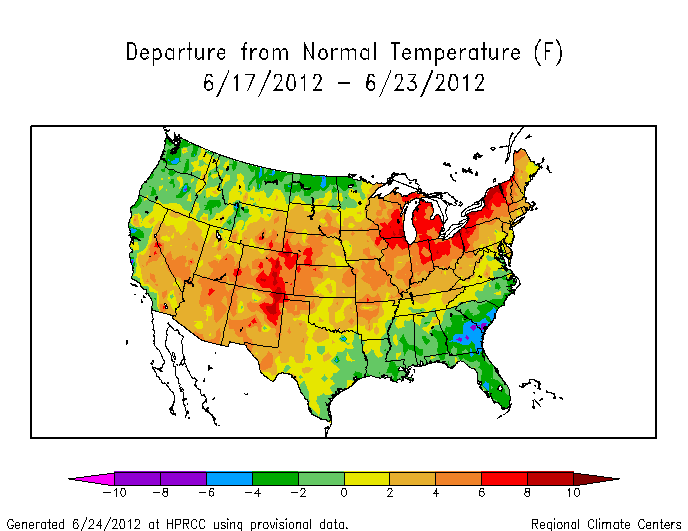 This brings the June average to date to slightly under 2°F warmer than normal. The warmest locations were Colorado Springs, Colorado (CO-COS) and Chicago, Illinois (IL-ORD) at +11°F and the coolest was Key West, Florida (FL-EYW) at -5°F. Only 16% of locations were cooler than average.